Small footprint. Very respectable compression sounds. Good value. When NZ firm Red Witch's Seven Sisters range arrived they offered the world's smallest pedalboard footprint, an honour now belonging to the budget Hotone pedals. "The Grace offers 120 hours of constant use from a four-hour charge"
Of course, shoehorning circuitry and a battery into a small enclosure isn't easy, and while the Hotones run from a 9V adaptor only, the Seven Sisters can operate from a rechargeable lithium battery as well as a 9V adaptor. The Grace offers 120 hours of constant use from a four-hour charge. 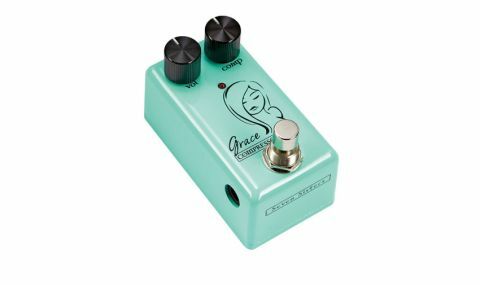 Finished in a shade that complements any Seafoam Green Fender, it's a simple two-knob design, with one to turn up the compression and one for the volume. It's sonic range isn't dissimilar to an MXR Dyna Comp: from a clean boost, through a tightening and thickening of your sound, to more obvious compression with a snap to the front end of the notes. Amazing Grace? Well, we wouldn't go that far, but she's a decent-sounding, value-for-money compressor that will slot neatly into any 'board.